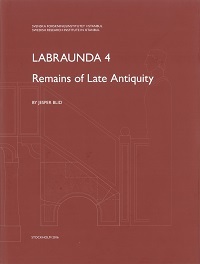 This study focuses on a quantitative analysis of Late Antique remains that have been recorded at the sanctuary of Labraunda from 1948 to 2011, and that date mainly to the period c. AD 300-600. The study comprises of all the diagnostic material from Late Antiquity found at the site, including architecture, architectural sculpture, ceramics, glass, inscriptions/graffiti, coins, organic remains, and various other small finds. The architectural remains include two church complexes, a residence with a tetraconch bath, and several rebuilt structures within the ancient temenos.